Ask your HD Stacker question: Is there interference with the Cable Internet when I use the existing cable in the house. I think you're asking if the cable internet service and the TV signal from an antenna can run on the same cable. If this is the question unfortunately the answer is no. The two signals will interfere with each other. All my online services (computers and blue payers - netflix and Hulu streaming) are wireless. The cable enters the house at the first floor, runs up to second floor, then to the basement and then plugs into a amplifier (EDA-AR01200). From there one line goes to the modem, then an ethernet line goes to the router. The other line (from the amplifier) goes to the 8 way splitter, from there six rooms have cable access. But I do not connect any devices directly to the cable lines from the splitter. If I have a separate cable line run from the attic to the splitter, we should be good? (without disrupting Internet.) correct? Or can I splice in with the antenna at the second floor? How large of an area should I have for the antenna in the attic. Do I need a power source in the attic next to the antenna or in the basement next to the splitter. Or will i need an amplifier for each TV? Can you suggest any other options based on cable internet, antenna TV and my description above. My location is Racine Wisconsin 53406. Between Milwaukee and Chicago. Yes, you can separate the two systems by running a separate antenna feed to the basement. Connect the internet feed directly to the modem feed line. Before I provide a recommendation for antenna, amplifier etc... I have a question. From Racine, WI. you can receive both the Milwaukee and Chicago channels. Do you want to receive both Milwaukee and Chicago stations or just one or the other? To receive both locations will require two antennas the HD Stacker and the EZ HD. The Stacker is 70" long, 63" wide at it's maximum width and 36" high. The EZ HD is 36" long, 34" wide and 3" high. You could receive all of the Milwaukee channels with the EZ HD however, the Chicago stations would require the Stacker. Yes both chicago and milwaukee stations. I did not expect to purchase 2 antennas. Some of the signals reaching Racine are too weak to use a multi or omnidirectional antenna so I can't recommend one of those. As you know Milwaukee is North and Chicago is South. To receive both locations will require two antennas or a rotor with the HD Stacker. Using two antennas or the HD Stacker with rotor will cost about the same. Most people prefer not to have the rotor because the two antenna system allows you to receive all channels from both Milwaukee and Chicago without having to adjust the TV antenna direction. Aim the EZ HD antenna North and the HD Stacker antenna South. Run a short cable of the same length from each antenna to the CC 7870 antenna coupler. From the coupler run another short cable to the LNA 200 preamplifier. Connect the down lead cable that feeds the antenna system to the preamplifier output. The preamplifier output will feed the signals from both the Milwaukee and Chicago stations to the TVs. You will need a signal splitter installed to supply multiple TVS. I do not have a current mounting system. I will be placing these in the attic. I have a shingled roof. I have attached a couple of pictures sent in by one of our customer's. 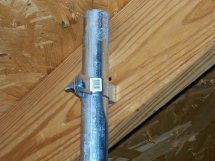 He ran a pipe from the roof to the floor of the attic using pipe brackets to secure the pipe. I'm sure the brackets he used can be found at most hardware stores. Will this work in your attic. You will need about 4 feet of vertical space. Below is the list of items required to set up the dual antenna system. It doesn't include the mount or mast pipe. Below is a picture of the two antennas set up outdoors. Sounds great! Thanks for all of your help.